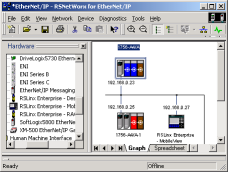 Course Description: There are many types of I/O Networks such as Devicenet, Controlnet, Ethernet, and Remote I/O. If these types of networks are being used in your plant, your students will receive a great benefit from this course. Real world examples will show these participants how to troubleshoot problems in these networks. Those who attend will also learn how to set up communication between the PLC and field devices eliminating many common erros technicians make during initial setup.